As far as Zimbabwean mobile telecoms goes, LTE doesn’t seem like the most relevant network standard. Despite delivering speeds that are significantly faster than the more common 2G and 3G connections and opening the door to a better experience of services that benefit from fast connections like video streaming, its rate of uptake has been affected by considerations like the availability of affordable LTE ready devices and a reliance on additional infrastructure investment. Which is why the most recent figures on Zimbabwean LTE coverage have been quite remarkable. According to the telecoms regulator, POTRAZ, Zimbabwe registered a 374.2% increase in LTE connections between the third and fourth quarter of 2015. This moved the total of active LTE connections to 124,179 up from a previous 26,185 connections. That’s almost 100,000 new LTE subscribers in 3 months. 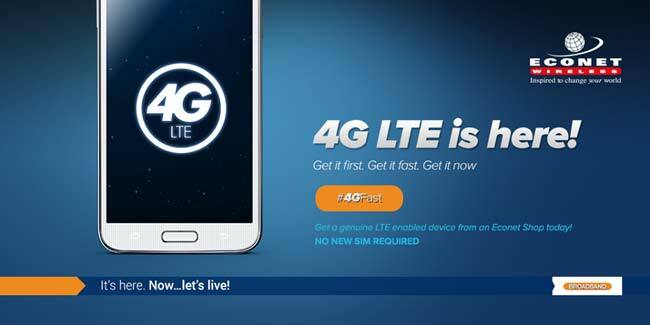 This increase is easily explained by the aggressive investment and promotion of LTE services from the two networks that have committed to 4G/LTE investments; Econet and NetOne. Over the past year, both operators have been engaged in the setup of LTE base stations across the country and as recently as September 2015, NetOne, a State-owned operator and the second largest mobile telecoms company in the country had the largest national footprint with 45 active base stations. Since then, Econet has taken the lead and was last recorded to have 3i2 base stations ahead of NetOne’s total that stood at 133 base stations during the same period. At the same time, Econet has been increasing its focus on the network standard, launching LTE-related packages and giveaways targetted at subscribers who use the network standard. While the increase is a huge confirmation of the potential that the LTE growth can have in the market, consistently growing those numbers isn’t going to be easy. This applies to both operators and even for Telecel which is yet to get to the 4G connectivity party but has promised to launch LTE this year. Part of the focus will have to be on encouraging its subscribers to move to the new standard with not only promos on data, but even a device distribution strategy. This might be getting harder to execute as credit financing becomes more complicated in a tight economy, but it would probably help maintain the momentum that has already been achieved by the 100,000 new LTE users. “by considerations like the availability of affordable LTE ready devices” – Huawei Y560 is a $100 device (if you get a runner its actually $70 from S.A). The sony E4g is $130. Can you define affordability here. Also can you do some speed tests for us on both Econet and Net*One so we have an idea of how this network is performing. I wonder why Techzim never conduct speed tests and give us results? Are there no readers with LTE mobiles who can advise us of speeds from where they live or work? Example Mbare, Harare? That statement leaves a lot of questions! 4G(LTE) is backward compatible with 3G. Thats means you can upgrade your network infrastructure, which l think thats what all Telcos are doingor has done. Now, do you mean you need a seperate 4G(LTE) infrastructure in addition to 3G? Just you mean the added cost of upgrading? There is no Econet LTE in KweKwe or the surrounding area? A buddy of mine has an HTC (Android based) phone with the LTE mode enabled and complains that his phone is rarely in 4G mode, falling back to 3G or Edge most of the times, even when he isn’t in transit. Econet should provide stable coverage, esp.., when you are charged for the pricier LTE bundles, yet in essence you’re a 3G user. Their coverage is basically an umbrella with holes. Would be nice if I could just complete a basic phone call without getting disconnected, let alone fast internet. Get the basics right! !